Your guests are sure to open up their hearts to this classic key favor with a useful twist. There’s something so alluring about a skeleton key. In addition to its classic shape, it has an air of mystery, and opens up the possibility of treasure, elegance, romance and so much more. 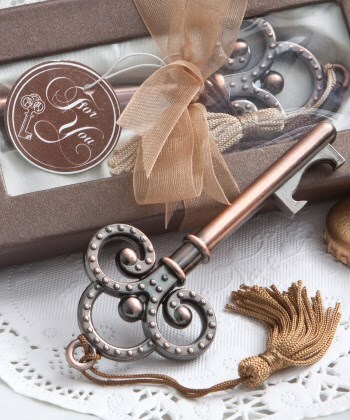 The skeleton key design has been amped up with an antique copper finish and a useful bottle opener edge. And, the end result is a winner!